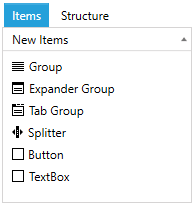 This article demonstrates how to add a custom UIElement in the NewItems section of the LayoutControlToolBoxView which is located under the Items tab. To add a new element in the toolbox you can use the NewItems collection of LayoutControlToolBoxView and insert a new LayoutControlHierarchicalNodeProxy object. 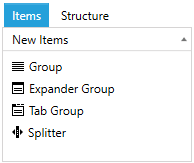 The proxy has several properties that describe the toolbox item - header, element type and element instance - which will be used when the item is dropped in the layout control. Example 1 and 2 show how to set up the proxy and add it in the NewItems collection. In Example 2 we add two additional proxies in the collection and they represent a TextBox and a Button which can be dragged and dropped from the toolbox to the layout control. The custom items will be drawn using the default toolbox item icon. You can find a runnable project showing how to alter this and also the approach described in the article in our GitHub SDK repository.